Looking for a great winter getaway for your clients? Orlando has just about everything you could want. With clear blue skies, temperatures around 24 degrees Celsius and special pre-summer deals, it’s no wonder Orlando -- Theme Park Capital of the World -- is the ideal locale for a post-holiday getaway to escape the frigid weather. Named one of the top March Break destinations by Skyscanner, visitors can take advantage of special Deals Made for Canadians, including discounts at all three major theme parks. From new adventures throughout the destination and splashy fun at some of Orlando’s coolest pools, to open-air activities like kayaking, visitors can enjoy a myriad of outdoor activities in the sunshine. For more information about these experiences, go to VisitOrlando.com/blog. Toy Story Land at Disney’s Hollywood Studios: this innovative park expansion features two new themed attractions, “Slinky Dog Dash” and “Alien Swirling Saucers,” and Woody’s Lunch Box, a walk-up counter service eatery which figuratively shrinks guests down to the size of Andy’s toys. Universal Studios Florida’s Fast & Furious - Supercharged: the speedy attraction takes guests on a high-octane adventure into the world of underground racing, right alongside stars from the Fast & Furious films. Infinity Falls at SeaWorld Orlando: thrilling rapids roar through this rainforest river experience that sends adventure-seeking guests plunging down the world’s tallest river rapid drop. LEGOLAND Florida Resort’s The Great LEGO Race: featuring themed minifigures, a rocket-powered surfboard and an espresso-fueled scooter, this thrill ride experience is the first virtual reality roller coaster designed for kids. 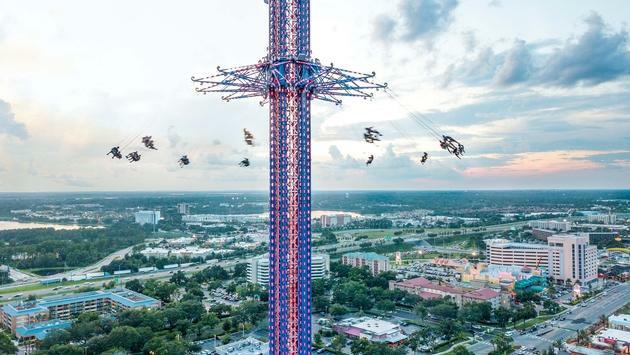 Orlando StarFlyer: located on the lively International Drive, this 400-foot tall giant swing spins at 70 to 100 km’s an hour. With warm temperatures all winter long, holidaymakers can cool off in some of the destination’s coolest pools, like Universal’s Cabana Bay Beach Resort’s retro-chic lazy river or Margaritaville Resort Orlando’s 14-acre water park. Those looking for a more relaxed vibe can sunbathe by the adults-only lakeside swimming pool at Four Seasons Resort Orlando at Walt Disney World Resort or the tranquil Waldorf Astoria Orlando pool. Orlando offers countless opportunities to create sunny memories with the family. From biking along West Orange Trail in historic downtown Winter Garden, to clear-kayaking through some of the most picturesque waters in Central Florida with Get Up and Go Kayaking, visitors will find exciting outdoor adventures perfect for taking in the sunshine. High-end views from one of Wallaby Ranch’s hang gliders and wild experiences through Orlando’s natural beauty at Wild Florida and Boggy Creek Airboat Adventures also give the chance to take in the fresh air and appreciate the favorable weather. I did the Boggy Creek Airboat Adventures tour a few years ago and loved it. It was a beautiful day and we got quite close to the alligators. I liked that they didn’t toss food at them but treated them as wild animals worthy of respect. Annual events throughout the destination bring festive fun for visitors of all ages. Some of the most looked-forward-to Orlando festivals include the Epcot International Flower & Garden Festival at Walt Disney World Resort, Universal Studios’ Mardi Gras and SeaWorld’s Seven Seas Food Festival. For more information about how Visit Orlando can help banish winter woes, visit VisitOrlando.ca.